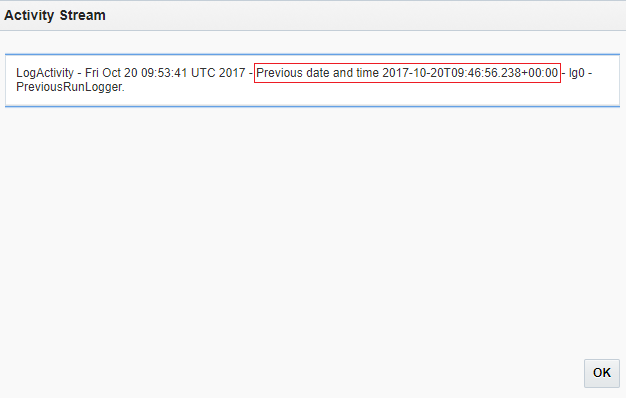 Sometimes it is required to get last run date and time of the scheduled integration to avoid the duplicate processing of data. This is possible in the Scheduled Integration type. This can be achieved using creating parameters in Scheduled Integration. We can create and update scalar type parameters in scheduled integrations that determine how to batch and read data received from a source location. We then use these parameter values downstream in the integration. We create and assign values to these parameters in the Schedule Parameters page that is available in scheduled orchestrated integrations. We can also assign values to these parameters in assign actions. Up to five parameters are supported in the Schedule Parameters page. Let's see how to get last run date and time. From the Actions section, drag an Assign activity into the integration, enter a name, and then click OK.
To complete the integration, add any Invoke activity as the mandatory step. Note: First time the last run date will come null. See the previous date & time is 2017-10-20T09:46:56.238+00:00. This is the time of the previous run itself. This was helpful. Thanks a lot for this information Ankur. 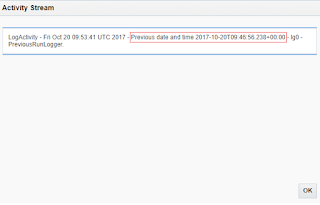 Batch processing will support in Oracls ICS?